Sooooo caffeine withdrawal is a real thing. On the second day I learned you can get headaches and feel lethargic from lack of caffeine. I have really been on a coffee kick lately so I didn't realize how much this would affect me this go around. It's a good experience to get my body back to neutral because I didn't realize how much caffeine and sugar I was consuming. I can really feel the difference. BUT I also can remember how I was able to do things fine without as much caffeine and sugar binge eating. So I am excited to "get clean" and start over. No brainer with caffeine withdrawal right? What can I say? I'm a slow learner. This cleanse is really clearing my mind and giving me time back from cooking or just my time slots formally filled with bored snacking. 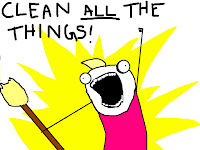 So I felt motivated the first day to get all these things done around the house and start going through paperwork, closets, etc. 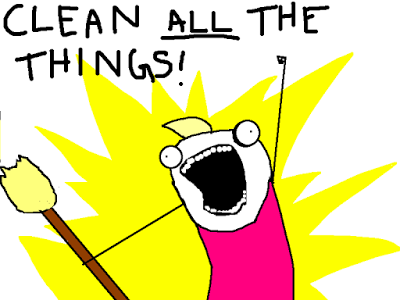 (the "CLEAN ALL THE THINGS" meme comes to mind...). I slowly started to run out of personal batteries though and wasn't able to focus. Half finished projects littered half my place and I was sitting in the middle just overwhelmed. Did I mention I missed my focus driven, energy pepping coffee? I had to sit the rest of the day out of projects. Day 2 was a little easier though. My body wasn't as confused. I kept busy with my day job and in the evening I went furniture shopping with an interior design client and I was good. I didn't take on anything too overwhelming and kept juices in my purse to sip on throughout the afternoon/evening. Have you ever tried to go off caffeine or felt overwhelmed by projects? Tell me about it! I'd love to hear your stories.